Well, I was a little premature in my last title, the freeze! Since just the other day, the temperature has dropped dramatically into the single digits. It hurts to go outside. Even with the wood stove cranking, we've had to use the heat more than we would like. It's hard to keep the house warm when it's so frigid outside. Now for my confession: I love Martha Stewart. Maybe that's not so shocking for those of you who know me well, but at least I'm willing to admit it! I'm impressed at her breadth of knowledge about cooking, baking, gardening, and really any and every craft out there. She has a smart and well-honed sense of design and both her magazine and show are quality. I've been watching her show and endless Christmas crafts lately, and I'm thinking it may have caused some brainwashing...but please don't think any less of me! 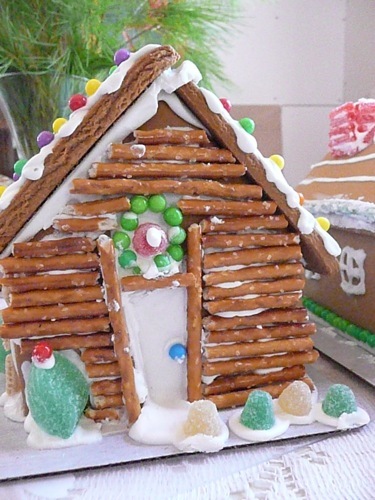 Speaking of Martha, our friends had a gingerbread house decorating party last weekend. They bought these cute sets and had gobs of candy, pretzels, and cereal to use. 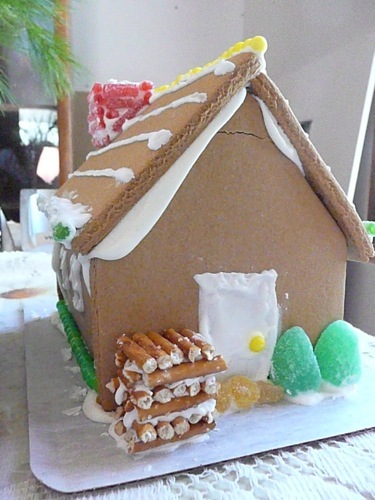 Oddly enough, I don't think I've ever decorated a gingerbread house before. Sugar cookies, yes. Paper houses, definitely. It was fun to do something holiday-related since I haven't gotten out any decorations this year. Matt normally calls me "Scrooge" and every year I have to be cajoled into cutting a tree and decorating it, but I secretly enjoy it. Especially the first night when it gets dark and you turn the lights on to make everything sparkle and twinkle. You can't help feel warm and cozy and loving and a bit sentimental for childhood. Since we're going away, we didn't put up a tree and I see no need to make lots of cookies or cakes. I can't go to Tuscany already fat and stuffed! We realized something interesting as all of the houses were sitting on the table together--each was very different. Matt and I's houses illustrate this point perfectly. 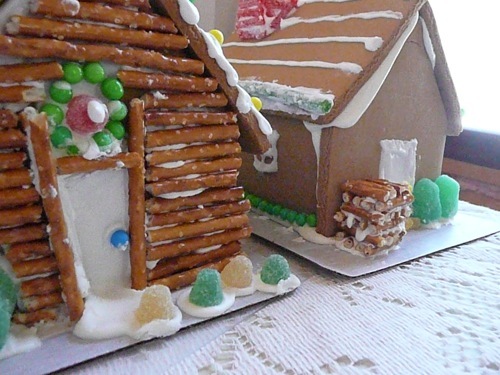 One is fanciful with lots of color and detail, while the other is practical with a well-constructed chimney and realistic wood pile. The first has gum drop steps leading to nowhere, while the second has an orderly border of shrubs around the perimeter. Guess who made each one? I guess it's lucky we found each other or I'd be very cold and he would have blank walls!